Transform MBOX to JPG raster images online and without ads! Use a MBOX to JPG Online Converter now or take our batch App! 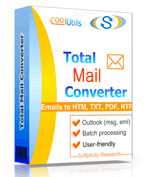 Description Many of us prefer to store emails in the MBOX format, which organizes all messages into one file. This format is intended for storing email messages on hard drives. In fact, a MBOX file is a long text file, in which messages are organized in a string, each message starting with “From”, which is followed by a space character and the sender’s email address. Initially, MBOX files were used on Unix. These files are supported by Qualcomm Edora, Microsoft Entourage, Thunderbird and Mozilla clients.